Deal 3 damage. Restore 3 Health to your hero. 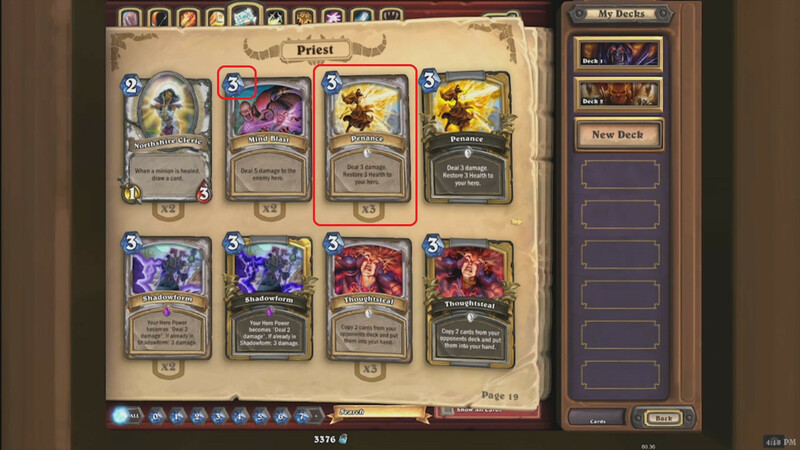 Penance was a priest spell card. It was replaced in patch 1.0.0.3388 by Temple Enforcer and is no longer available to players. This card has some similarities to Holy Fire, another priest spell included in the Classic set, as well as Bash, a warrior spell from The Grand Tournament and Tidal Surge, a shaman spell from Journey to Un'Goro. The artwork for this card came from the World of Warcraft Trading Card Game "Tomb of the Forgotten" series, for the card Divine Redemption. Patch 1.0.0.3388 (2013-06-22): Removed, replaced by Temple Enforcer.